You start your day. Plan some tasks. Write it down somewhere and start working on it. When it’s way past your work time, you think about that to-do list (stare at it if you have it written) and curse the world for not having enough time in the day. If you are nodding your heading in agreement, you – my friend, are suffering from an acute condition of expanding-to-do-list. Well, I am neither a brain doctor nor a self-help guru. I can not help you in overcoming procrastination and getting your work done. I can give you an Excel To Do List template that can handle your ever-expanding list (you will still have to make one and do all the work). Jokes aside, I do believe it is helpful when you maintain a to-do list. I create one every morning, and on some lucky days, I also get the pleasure of checking off most (if not all) the items. A Simple printable Excel To-do List. To-do List with drop downs to mark a task as complete. To-do List where you can check a box to mark a task as complete. To-do List where you can simply double to mark the task as complete. This one is for people like me. I like to print my to-do list and stick it right in front of my eyes and then work on the items on the list. 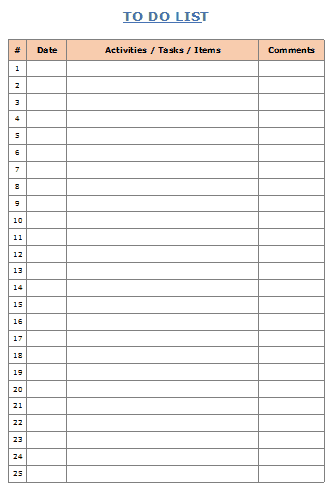 Here is a simple Excel template where you can fill the tasks and take a print-out. If you prefer writing the tasks yourselves, simply print it first and then fill in the tasks. There is a separate column to mention date and comments (if any). If you don’t need it, delete these columns before printing. If you prefer making and maintaining the To Do list in Excel itself, you are in for a treat. Enter key tasks to be completed. Assign priority to the tasks (High, Medium, Low). The task gets crossed off (strike-through format is applied). The row automatically gets shaded in green color. The progress bar changes to show the % of tasks completed (based on the priority). The weights are given as follows (in the pic below). If you want to change the weights, you can easily do it by changing these values. In the download file, columns G to J are hidden. Unhide it to change the weights. Total Score: Add all the weights for all the activities. For example, if there are 2 high priority tasks and 1 medium priority task, and 1 low priority task, the total score would be 14 (5+5+3+1). Completed Score: Here we add all the weights for all the activities that are completed. For example, if out of 4 activities, 1 high priority activity has been completed, then the Completed Score would be 5. % Completed: The value when we divide Completed Score with Total Score. For example, in the above case, it would be 35.7% (5/14). This template is exactly like the one with drop downs, with a minor difference – it has checkboxes instead of the drop-down. You can mark the task as complete by checking the checkbox. If not checked, it is considered incomplete. The task gets crossed off (strike-through). NOTE: Be careful while adding deleting rows. Deleting a row does not delete the checkbox. I find this version of the template the best of all. It uses a small VBA code to enable the double click event where you can mark a task as completed by simply double-clicking on it. As soon as you double click on the cell, it automatically inserts a checkmark in that cell. NOTE: Since this contains a VBA code, it should be saved in .XLS or .XLSM format. NOTE: Since this template contains a VBA code, when you open it, Excel will show a prompt to enable content. You need to enable it for this to work. So here are 4 Excel To-do list templates that I find useful and often use while planning my work. While I have shown you the example of common daily tasks, you can use these to-do list templates in many different ways. Project Management Checklist: Since a project can have many moving parts to it, creating a daily or even weekly/monthly to-do lists can help you keep a tab on all the important stuff. Client onboarding checklist: You can create a quick client onboarding checklist and hand it over to your sales/customer executives. This will make sure a client gets a seamless and complete onboarding experience. Grocery checklist: While it may sound weird to create one in Excel, I have seen people do this. This has become more useful now that we can order stuff groceries online in a few minutes. Event Management Checklist: Event management can get crazy and out of control if not planned well. A handy to-do list can save you (and others) a lot of time and money. Travel Itinerary and Packing checklist: I love to keep my traveling hassle-free by having a to-do list of stuff that needs to be done (bookings, visa, tickets, etc). You can also create a packing list to make sure you don’t leave important stuff behind. Blog Publishing Checklist: I have created a to-do list to make sure I don’t miss out on the important parts when publishing a blog post on this site. These tasks include doing grammar and spell-check, making sure titles are correct, images are present, tahs and categories are assigned, etc. What goes into making the Excel TO DO List template? There is no rocket science at play here. 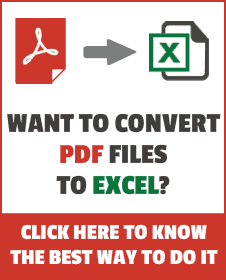 Simple Excel techniques come together to make it happen. Conditional formatting (to highlight a row in green when a task is marked as completed). Strikethrough Format (appears when a task is marked as completed). Excel Drop-down Lists (to show the status in the drop-down). Check Boxes (to mark a task as complete by checking it). VBA (to enable double click event). Excel Charting (to create the progress bar). I hope these templates will help you become more productive and save some time. To Do List template Integrated with Calendar in Excel. Task Prioritization Matrix Template in Excel. Shared Expense Calculator in Excel. Is there a way to increase size of font, make columns wider, stuff like that. Hi Sumit. Could you please further explain how you did the progress bar? Because the only way I know how to do it is by conditional formatting. I don’t see you use conditional formatting for this one. Appreciate it a lot. Thanks! What are the instructions to add more cells beyond 25? Hi, I have tried your to-do-list, but when I tick row 21, the ribbon goes backwards to about the 30% mark and only goes to 100% when all boxes are ticked, what could the problem be, otherwise an excellent article? Hi Summit,, I would like to learn about how to make the last template.. I am seeking a formula or macro to automatically move completed items to the next blank line of sheet 2. Thanks for the templates, very cool. I am no good with excel but I have thought of an idea. It would be good to have a deadline column and then depending on how far the deadline is from the current date, excel works out the priority. For e.g. maybe have a priority bar that changes colour – blue yellow orange then red. For those tasks that have no deadline also have that option and it will always stay low priority for e.g. stay blue. I don’t know if this is possible to do but this is definitely something I would benefit from and so maybe others too. This is probably just something that bugs me: the fact that when it is completed it is still on the to do list which isn’t necessary and blocks the view of what you need to do next, but then the % bar wouldn’t work which I think is really cool. Maybe there could be a running total of tasks completed (but these will be removed off the to do list) and tasks left undone and a % based on that? I know it will then never be 100% if you keep adding to the list but thats more like reality you will always have tasks to do. Thanks again for the template I will be using this one for now until I master coding so I can create sheets like this myself. Wonderful work Sumit…. thanks! I’ve been looking for something like this. Is it possible to have to-dos grouped within projects? Then if one has multiple projects, sort the projects and tasks based on prioirity, hi-med-lo or A, B, C, as I use. The next key step is to take this sorted listing and add a numerical order to what I’m going to do for the day or week. (This numerical order allows for some judgement between what is important and urgent.) This is what I’ve been doing daily on paper for years…. It’s time to join the computer world. One challenge in using this system Is the archiving of yesterday’s or last weeks to-do list, so one can look at past records as a time log to see when a task was performed. One perifierial suggestion… I read you check off completed tasks daily. Me to…. very fulfilling. In fact, I MUST do so in RED ink, which adds to my satisfaction! Should be easy to change in excel, right? Thanks …. I look forward to your reply! Hi Sumit, how can I add two columns before the “Complete” column, and keep the calculations? Hi Pal, I love your tips and templates!!! So I can start to do same activities daily. Hi! How can I add rows to the TO DO LIST with check box? Thanks. I like #3 – With Check Boxes. In mine, I don’t use a text box next to the chart to indicate the total. I use a “picture” (using the excel camera tool) instead. I do that because this way I can conditionally format the cell that contains the total. Of course, that doesn’t work if you hide the cell, but I solved that my simply moving all that stuff to column AA since there is no reason for me to need to scroll over there anyway. To add rows, you need to modify the code a bit. Here is a template where you can list up to 100 activities. Keep it up and keep share these kinds of tricks……….. I think you should keep going, but try to promote yourself too, so that you get the motivation to write more.